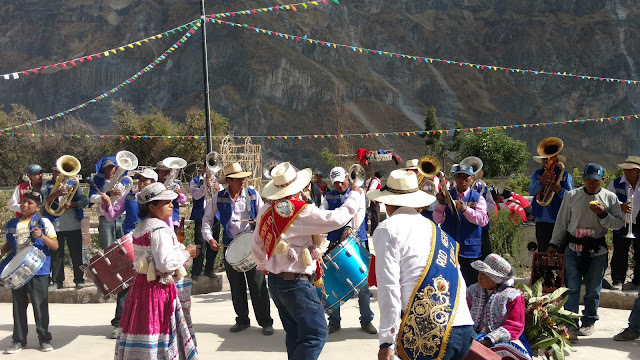 Having descended the steep canyon trail, we hike back up the other side in the afternoon, the sound of beating drums and trumpets echoing through the Colca growing louder as we approach the tiny town of Malata. 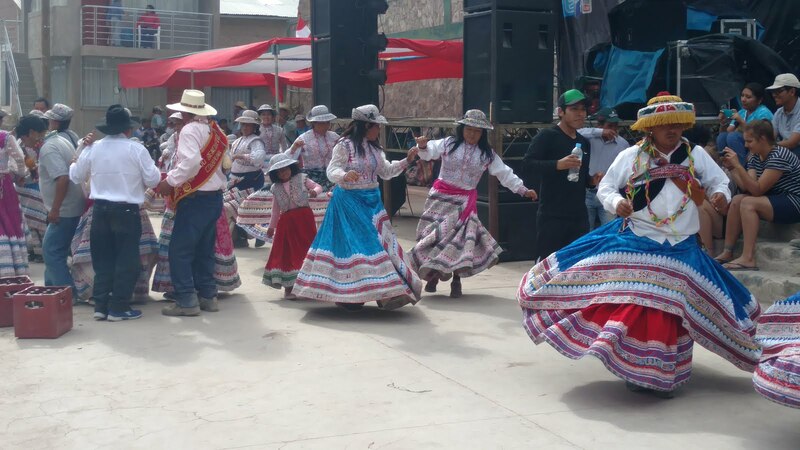 It's their annual Fiesta, and both men and women are dressed in traditional clothing, dancing, as the local band of this tiny, tiny town play their hearts out. Alcohol is flowing freely and somehow our guide is passing out tall bottles of beer to all the trekkers in his group; I'm pretty sure they weren't included in the tour price. He seems bewildered when I politely refuse, offering me again; I stand firm. I sit on the church steps, enjoying the show. Twenty minutes later, having downed at least a couple bottles of his own, my guide approaches me; I try wave him off, but he insists. "I don't drink," I state firmly. He shrugs and disappears. After watching the festivities for a little longer, I'm asked by an elderly village woman to dance with her, I oblige, no alcohol needed. Finishing my dance, I walk away to edge of the festivities, conversing with the cool German guys in our group. A small local man approaches and politely suggests it might be time for us to go. I'm bewildered, this is fiesta time! My Spanish is pretty decent so there was no misunderstanding. I guess we should wait for our guide before leaving. Oh, here he is. He beelines towards me in a sloppy drunk manner, getting up in my grill, I back-up a step, he advances accordingly, once again offering me beer. "I just don't often. No need." "How can life be fun without drinking?" he tries to force a cup into my hand. "Drink." "Thank you, no." I turn away, trying to end the conversation. Like a fighter seeking an opening he circles around. "You're insulting. Everyone's wondering why you're not drinking. 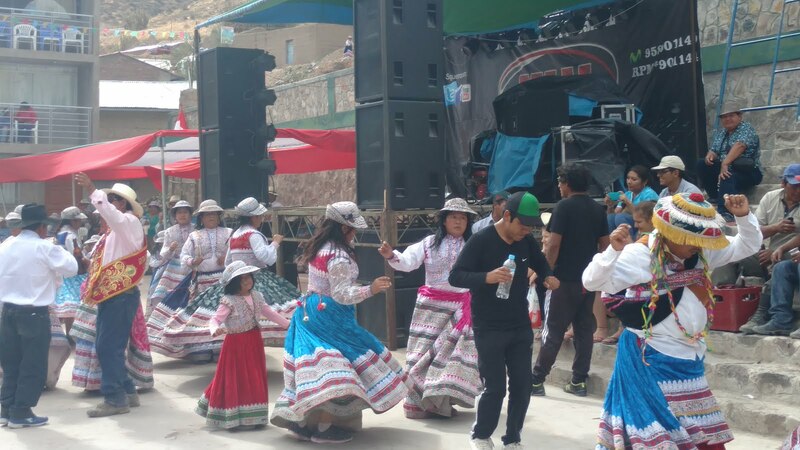 This is their fiesta, you're insulting them." He gestures to a villager who seems to nod affirmatively. Now I'm confused and tired of all this and want it to stop. I take the small plastic cup of beer poured, clink it with that of the villager, and take the smallest sip I can. Guide staggers away. I toss the remnants of the cup in the nearest bin. Once again, the first small villager approaches me, letting me know it's time for me and my German friends to go. "Explain why?" I ask, politely as I can. "Because your guide is really drunk, and making a mess everywhere." "Yeah," I sigh, "Understood. As soon as he returns, we'll all leave." I translate the conversation to my German friends. We wait ten minutes, looking around for our drunk and rude guide. It's actually going to be dark soon, and the descent back into the gorge is steep and littered with stones, not a trail to be traversed in the dark. "We should get going," I suggest. "But what about the guide?" "We waited, he's not here. We need to make it to camp before dark." And so I lead us down the trail, my new German friends asking me my views of US politics. It seems as though most Europeans have a greater understanding of our political system and current events than the average American citizen. Slowly descending, admiring the canyon views, we eventually make it down to the Oasis. The trees are laden with fruit, the grass green, and pools of water offer us a chance to ... get wet; I can't say cool-off, we're at 8,500 feet, it's chilly. Darkness creeps over the canyon, luminous stars light the night sky, my neck craned upwards, my jaw slack for several minutes enjoying the spectacular show. Our guide still hasn't shown up. 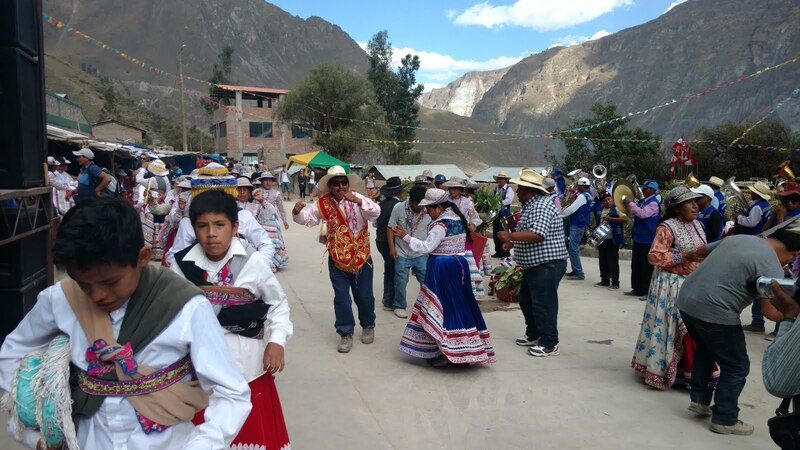 In our trekking group is a Peruvian guide who makes his living taking people on the Inca Trail. He's taken this trip to experience the Colca. He stands and defends our guide, explaining that, especially at this time of year with the Fiesta, it's impossible to go through the town and refuse to drink alcohol. If you do, the townspeople would be offended, and they wouldn't let you come through town again. On the one hand, that's similar to what our lost guide briefly communicated in Malata, on the other hand, it's completely retarded. First of all, he was the only one to whom I refused the offer of alcohol, he's the only one who could have known. Second of all, if politely declining an invite to consume your beer is considered offensive to the point of banishment, then your culture and thinking have major progress to undergo. To take the mode of thought to an extreme, it's akin to a the Catholic church of the Middle Ages or ISIS today forcing their paradigm/ religion upon the heathens/ infidels. I tire of people saying we have to respect ALL cultures and never to judge. There are differences, there are paradigms of the world and behavior/ thinking that leave everyone better off. Synergistic paradigms are superior. Our guides reappears at 5 AM, our scheduled departure time, in what might be an effort to keep his job. We ascend up and out of the canyon, not mentioning what transpired. 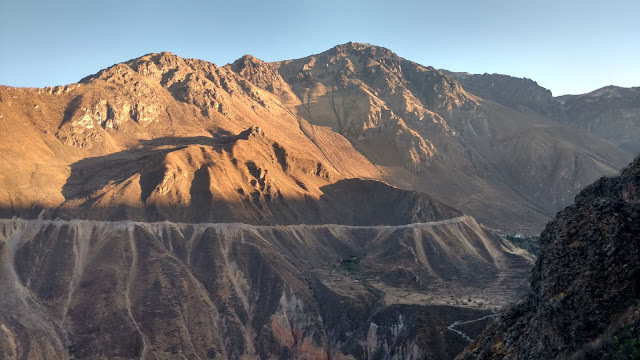 I get back to my AirBnb in Arequipa and discuss the events with my hosts. When I mention the claim of the guide(s) that I offended the townsfolk by declining to drink, they look at me like I'm crazy and say this is simply not the case. So, I'm happy to tell you that while Peruvian culture might not be retarded, our guide certainly was.